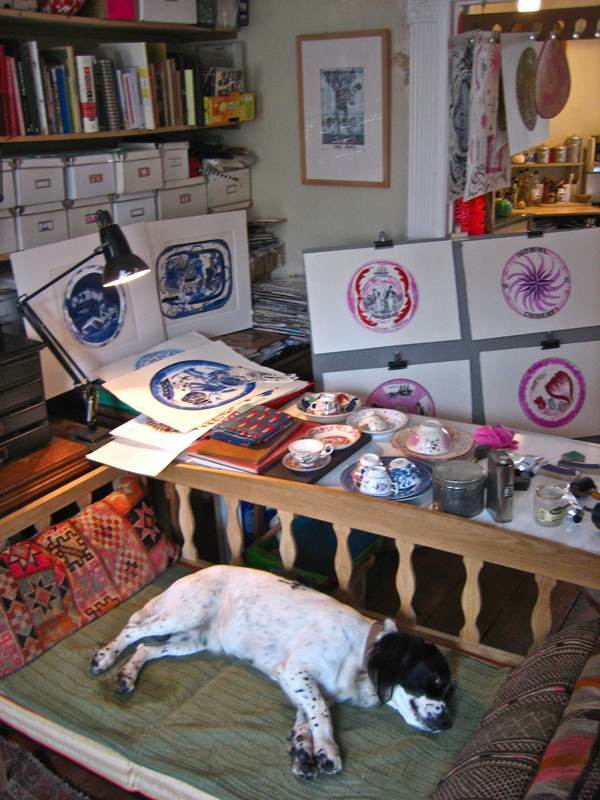 Laura Knight’s dog Moss wisely takes a nap and lets his mistress get on with completing her latest works ready for her exhibition Pottery Marks, opening at Town House in Spitalfields next Thursday 17th November. Contrary to what you might think, the cups on the table are not evidence of an imminent tea party, but placed there as a reference by Laura while making the new pictures she will be exhibiting, which have all been inspired by her collection of old china. 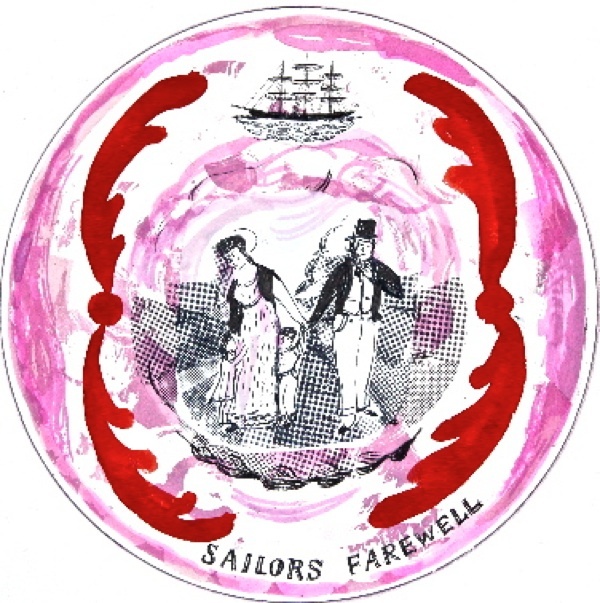 A graphic artist whose work is informed by a deep affection for vernacular English pottery of the nineteenth century, Laura Knight’s renderings of Staffordshire Figures, Willow Pattern plates and Sunderland Lustreware capture the spirit of these pieces with rare grace and economy of means. 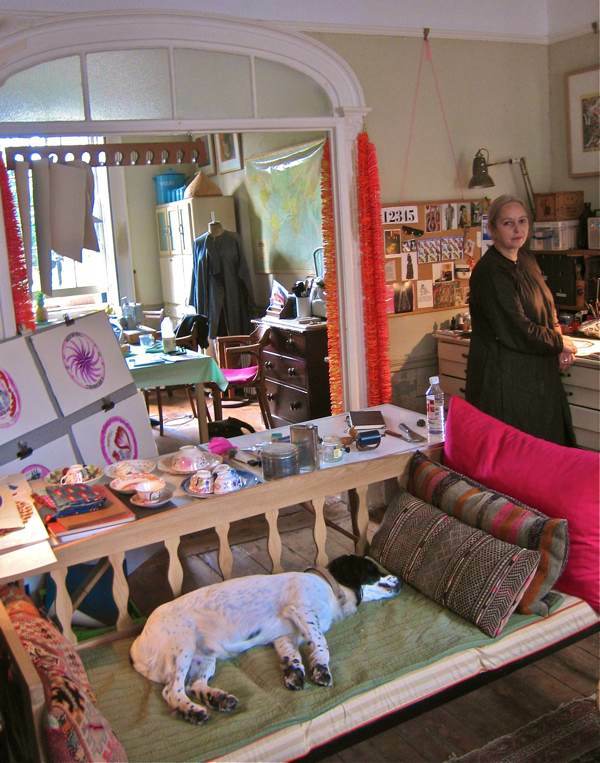 In the popular tradition of English Folk Art, using sinuous line and sensuous colour – hers is the assured work of a mature artist in control of her medium. The grove of limes on the green outside were just turning gold and shedding their leaves when I paid Laura a visit, taking the opportunity to admire her collection of pictures, china, art books and other treasured paraphernalia, in these two beautifully-proportioned rooms that receive more sunlight when the trees are bare. Laura welcomed me with tea and home made apple cake at her kitchen table, before giving me a preview of the fresh pieces of work which were due at the framers later that day, including a table cloth – that Laura draped across the table – upon which she had painted calligraphic patterns and sewn images of Willow Pattern plates as if laid ready for a picnic. 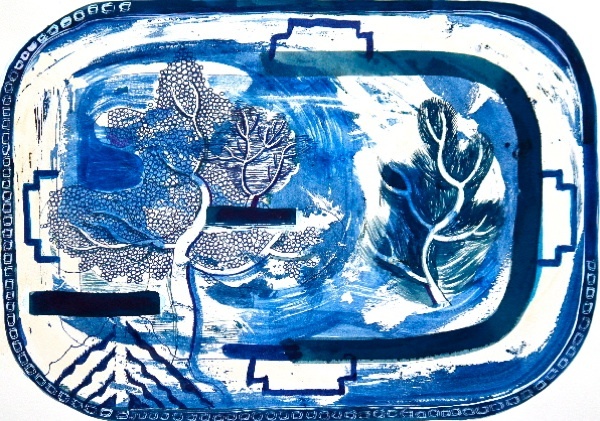 Yet I was impatient to wolf my cake and stray into the other room to examine the spirited pictures on paper Laura had created using paint, ink, collage and printing - in sets of four – in blue as homages to Willow Pattern, in pink to celebrate Sunderland Lustreware and in subtle ochre referencing Minton pottery. Here was an image of a plate for good attendance at Sunday school inscribed with the names of Laura’s grandparents who grew up in Bethnal Green, George & Ada. 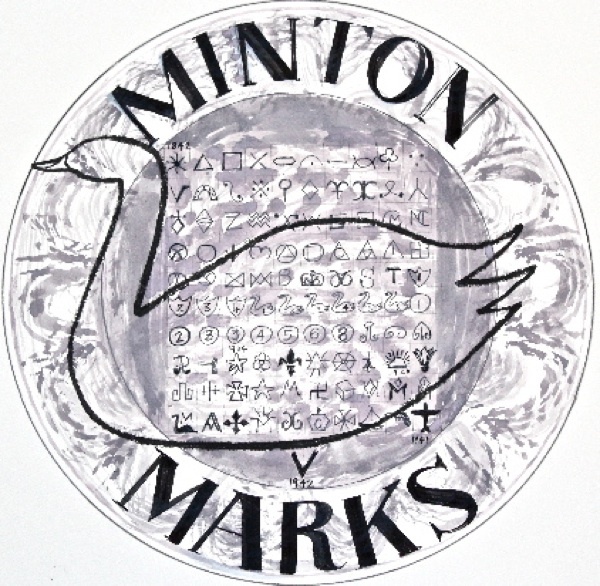 Here were all the Minton date stamps from 1842 to 1942, including “V” for victory and an airplane during the war years. 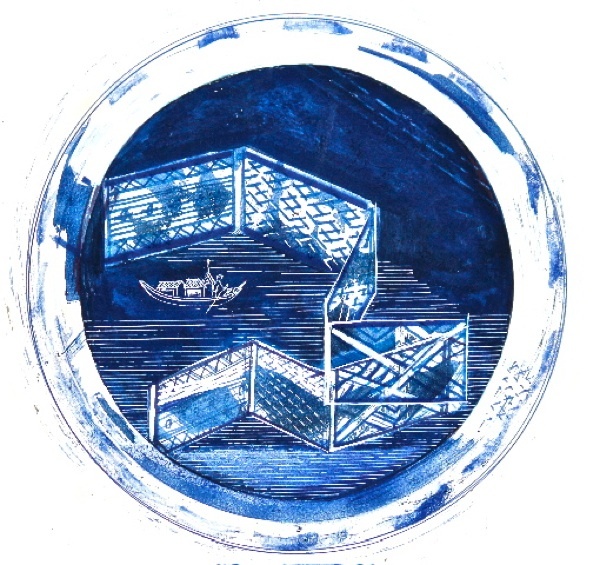 Here were scraps of Willow Pattern, inspired by the spontaneity manifest when women chopped up transfers and scattered them on the undersides of tureens in factories a hundred and fifty years ago. Laura’s witty graphic interventions always serving to reveal the maker’s presence behind these familiar artifacts, delighting in the flaws and random elements born of mass-production done by hand. 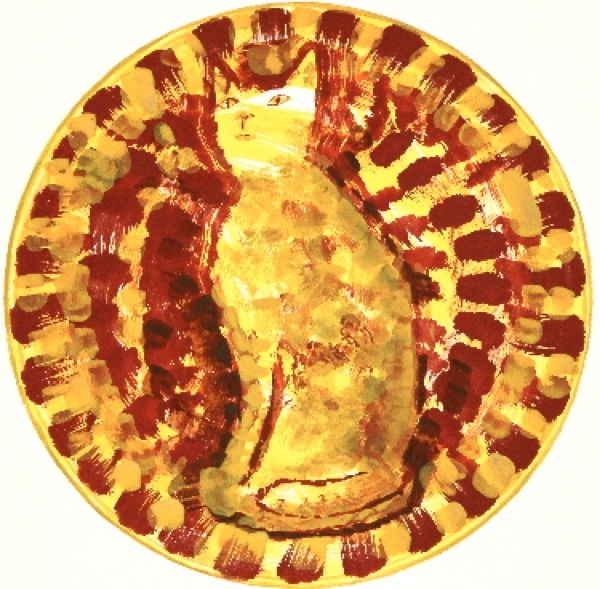 Pottery Marks came about as a result of my interview with Laura Knight a year ago, and now I cannot wait to see her vibrant images brought together in a gallery for your interest and delight. 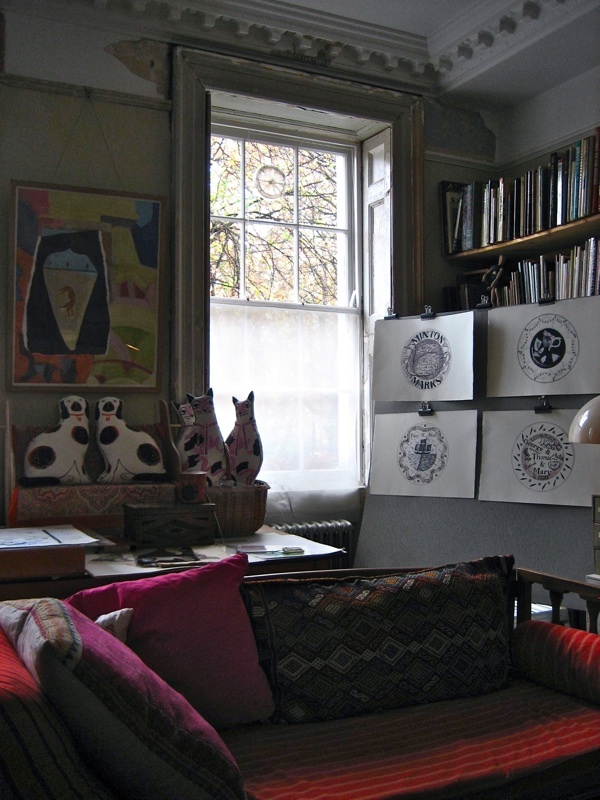 She appreciates the emotional resonance of beloved ceramic designs which have survived in the popular imagination over generations, and her tender and poetic work is the perfect tonic at the start of an English Winter. 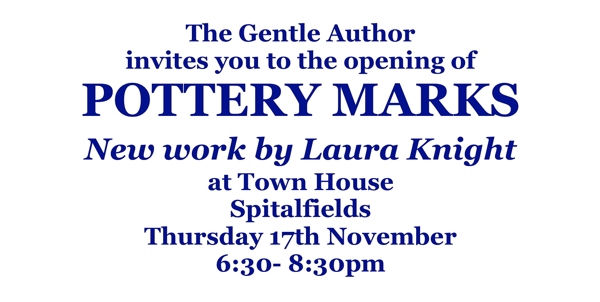 POTTERY MARKS - New work by Laura Knight, runs from Thursday 17th November – Saturday 3rd December at Town House, 5 Fournier St, Spitalfields, London, E1 6QE. Open from 11:30am – 6pm, Tuesday to Sunday. Thank you for this one. Thank you for all of your pieces, actually. Though it’s a double-edged sword because they make me homesick for England, and for London especially. Here I am in Santiago having waited all day for this latest post on the Spitalfieds Life blog,with a cup of tea(of course) but not in a china cup I’m afraid to say! Everything looks so lovely ready and waiting to go…………Moss as usual is tired out,I expect he had to bake the apple cake as you were busy painting and wotnot!! Loads of luck on your opening night and thanks to “the gentle author” for bringing you to all of us. This looks absolutely wonderful. Right up my (Fournier-) street. I shall do my damnedest to make it. Lovely! Wish I could come and see it. Leon must have taken Moss for MILES if he was that placid! Looking forward to Thursday – the work looks great.